Special thanks to our guest reviewer Generbeener for contributing this excellent review! Warm Bodies takes an interesting look at Shakespeare’s Romeo and Juliet through the lens of the infamous zombie apocalypse. “R,” (played by Nicholas Hoult) the film’s Romeo, is a surprisingly handsome zombie living in the airport with hundreds of other zombies who have come to live there. We soon meet “M,” R’s Mercutio-like best friend (Rob Corddry). Together with about ten other zombies they venture out of the airport to find food (obviously their favorite food is human brains). This is when we meet Julie (Teresa Palmer), her nurse-like best gal pal (Analeigh Tipton), and other young men and women about to embark on a supplies reconnaissance mission. Real girls know how to use machine guns! 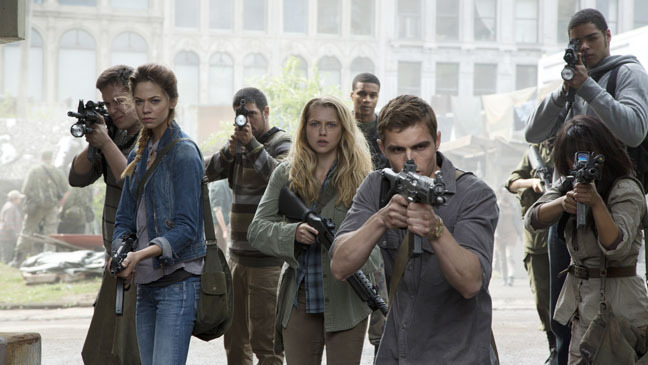 While on this mission Julie and her fellow young soldiers are attacked by R’s gang of zombies. The minute R sees Julie he is stunned by her beauty, as seen in slow-mo. R then rescues Julie from the rest of the zombies and sneaks her back into the airport and into his broken down 767 which R calls home. The 767 reminds me of Disney’s Wall-e’s little home, where every inch is covered in knick-knacks and colorful items, R’s sad attempt to reclaim some of his humanity. After a few escape attempts and some riotous playing undead by Julie, R and Julie begin to build a friendship. R only wants to be helpful and protect Julie, but all Julie wants is to get home. She eventually convinces him to take her home and they start the dangerous journey back to the human compound. Through the friendship and eventual love built between the two leads the zombies begin to heal themselves and slowly grow warm again. At one point R sneaks into the human compound and finds Julie on the balcony of her home (but soft, what light through yonder window breaks? ), which begins a series of events that bring the humans, zombies, and boney’s (a zombie that has torn off all of its flesh and has no hope in ever being human again) into an all out war. I won’t go any further in case you haven’t seen the film. Don't pick at it, it will only make it worse! 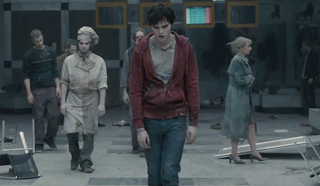 Warm Bodies has line after line of laugh out loud humor, from R’s “un”-dead pan, sarcastic voice overs to cleverly spun word play (by the humans obviously because zombies have speech issues). 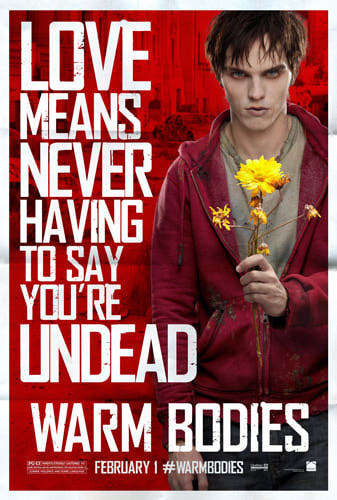 This film knows it is ludicrous and therefore fully plays off the irony of a zombie falling for a human. 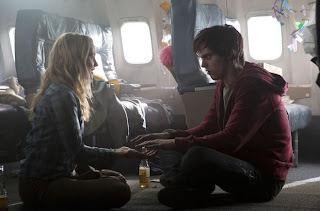 In my favorite scene Julie wants to take R to see her father (leader of the humans) to prove that the zombies are healing themselves back into humans. So she and her friend force R to bathe, dress and then allow them to cover his still slightly pale skin in makeup. Even in his zombie state R knows guys don’t usually wear makeup, but in the end he comes out looking like the handsome man he once had been. 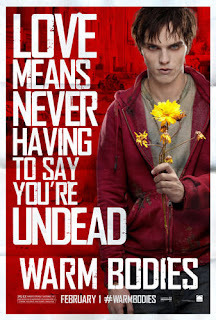 I’m giving Warm Bodies a 4 out of 5 stars for its imaginative reinvention of the Romeo and Juliet story as well as for some seriously funny moments. Director Jonathan Levine does a splendid job of merging truly funny moments in with the sensitivity of young love and the suspense of zombies. With relatively little gore and suspense this is the zombie film for people who hate zombie films! I know I’m counting down the days until I can buy it on DVD (because I’m too poor to own a blue-ray) and I’m even thinking about going to see it again. In fact I’ll probably see it again sometime this week. Won’t you join me? Take that Edward and Bella! When not falling in love with undead men, Generbeener likes to discuss the finer points of StarWars over a nice cup of Chai Tea Brevé.